Manteca’s #61, Guy Guibor picked up his second win of the season to extend his season points lead in a controversial 50-lap Western Late Model race at Stockton’s 99 Speedway on Saturday. Guibor, defending champion #5, Pete Anderson Jr. of Stockton and Sacramento’s Pete Hernandez went three wide at mid race, touching off a chain reaction that eventually resulted in Anderson pushing Chowchilla’s #32, Eric Humphries hard into the pit gate opening at the start of turn three. Humphries’ car was totaled and Anderson’s car sustained major damage in the incident. During the ensuing red flag stoppage Anderson limped to the pits to make repairs while officials cleaned up what was left of Humphries car. However, officials deemed Anderson guilty of over aggressive driving and would not let him return to the track when the race resumed. Hernandez, #20, was not done either. He had several restart opportunities to pass Guibor late in the race, but Guibor was able to fend him off on each occasion. 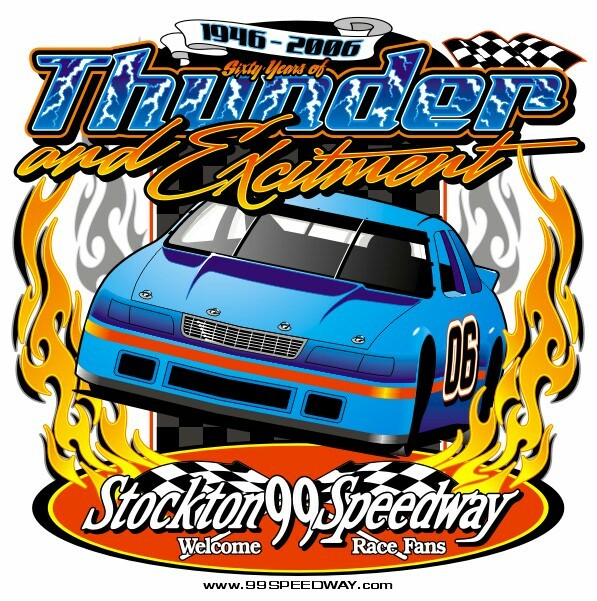 Stockton’s #90, Ron Strmiska Jr. finished the race in third, Mark Holeman came in fourth and Stockton’s Joey Stearns completed the top five. In one of the best Grand American Modified (GAM) races of the season, Ripon’s #66, Mike Regelman picked up his second straight win by holding off #10a, Jay Linstroth, of Citrus Heights, in an exciting side-by-side shoot out at the end of their 50-lap main. Linstroth led the race from the opening green flag as Regelman and Galt’s #2, Jason Kerby battled just behind him for the second spot. Regelman was finally able to overtake #2, Kerby on lap 38 and then got his shot at Linstroth when the one and only yellow caution of the race came out on lap 44. Regelman grabbed the lead from Linstroth on the restart and then held on for dear life as Linstroth tried repeatedly to get underneath him during the closing laps. Linstroth’s efforts were in vain as Regelman took the checkered flag by a half a car length. Although disappointed in his second place finish, it was nevertheless a big boost to Linstroth’s 2006 championship aspirations. Last Saturday Linstroth destroyed his car in practice and then borrowed car from a friend for the main, which he promptly crashed seven laps into the feature. As a result, his lead in the season standings dropped to just two slim points over Sacramento’s #5, Jason Philpot, the defending GAM champion, coming into this Saturday’s race. Tony Noceti #6, of French Camp took third in the GAM race, Dixon’s #42, Jerry Dubach grabbed fourth, Kerby slipped back to fifth and Philpot lost ground with a disappointing seventh. Lathrop’s Mark Henslee picked up his fifth win of the season in the 30-lap Pro-4 Truck main which ran caution free. Ron Robeck of Milpitas and Oakdale’s Jason Dalrymple rounded out the podium. Henslee also set fast time in qualifying and won the dash to register his third sweep of the season. Henslee performance was so dominate that Robeck was the only other truck in the starting field of nine to finish on the lead lap. Stockton’s #99, Donny Darter also pulled out the broom as he posted a sweep on the way to winning his fourth American Limited Stock Car (ALSC) feature of the year. Darter started the 15-car ALSC main from the front row, along side of Lodi’s #31, Jeff Ahl. The two battled door-to-door through the first five laps before Darter was finally able to gain the upper hand. Although there was no catching Darter once he claimed the top spot, Ahl turned in a strong performance to finish second and Stockton’s #1, Joe Allen, making his first start since badly damaging his car on July 1, took third in the 30-lap race that ran caution free. Mark Baily, #40, of San Leandro, quickly worked his way up from his number four starting position in the 20-car Legends of the Pacific feature, to take the lead from #0, David Winchel, of Sebastopol, on lap 16. Baily was never seriously challenged for the remainder of the 35-lap race as he cruised to t he checkered flag by several car lengths ahead of runner-up #2, Zachery Kavert of Redding. Tracy’s #22w, Jeremy Wood finished in third, Winchel hung on for fourth and Frankie Marks, of Orangevale, rounded out the top five. The NASCAR AutoZone Grand National West Series returns to Stockton 99 Speedway for the final time next Saturday night, August 5, for the 9th Annual Dodge Country 200 by Havoline/Napa Belts & Hoses. The NASCAR Dodge Weekly Racing Series program will also feature the Havoline Western Late Models in round #8 of the HOTWOOD 1000 Series, presented by J.M. Environmental, and the American Limited Stock Cars, by C.L. Bryant.